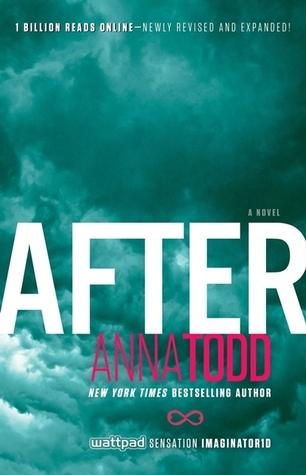 Presenting After #1 After by Anna Todd. Fifty Shades sure started a trend didn't it of fanfictions being given the best selling status. Hype sure goes a long way in helping it along ..... And here i'm swayed again by the hype to see what Anna Todd's NA fanfiction AFTER is all about. I may be late to the bandwagon because apparently everyone I know had already read the series or posting about it on the social media ..... but here I am finally! First appearing on Wattpad as a One Direction fan fiction. Since then After has made a big journey to getting the best selling status. I am definitely not a fan of this series. While I did like the story better than Fifty Shades of Grey .... don't flame me but that was just bad writing, showing a bad image of females in general and plain bleeding on the ears *sighs* I had the misfortune of getting its audiobook. Worst decision of my life. But I decided to overlook the 1D connection when I began reading this book. Good thing I did that too. Anyways I liked Tessa as a character. She is good and reliable. With a penchant for micro-managing her life. She has the ambition to succeed in life and had a good head on her shoulder. Although she felt judgmental at times as well. Never doing anything out of the ordinary or anything unexpected. And a great boyfriend too who is very reliable but as the plot would have it she meets bad boy Hardin and it all goes down the drain. Hardin is the definition of a bad boy. He is plain rude and most of the time verging on cruel. He had a bit of dark past to look back on and as a result, he is not the most complacent of them all. But he does have his good moments as well, when he is joking, happy or bring cocky. He doesn't like Tessa at first but they kept getting thrown in the same situations, eventually he gets attracted to her. And she in turn brought out the good side in him. "A chaotic hot & cold romantic pageturner"